Bill and Melinda Gates Foundation has funded Farm Concern International, FCI to generate income worth USD 969 Million and build better livelihoods for 115, 491 smallholder households by linking them to 2,187 wholesale traders within 48 Months. 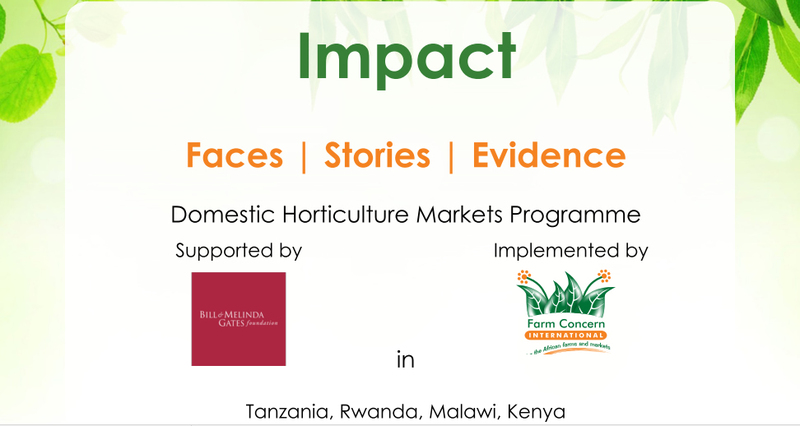 Over the years, implementation of Domestic Horticulture Markets (DoHoMa) programme has impacted over 118,282 direct beneficiaries such as smallholder farmers, buyers and frontline facilitators at farmer and market level in Tanzania, Kenya, Rwanda and Malawi. Smallholder farmers have recorded cumulative sales worth USD 197,759,320, a 400% increase in turnover against the target sales value. The intervention has continued to bring out several lessons from smallholder commercialization in the four target countries. The program beneficiaries continue to be exposed to use of new technologies and management practices resulting in a general increase in investment on production. Through the programme efforts, a total of 99,322 acres of land under target crops has been commercialized.